A designer inspired bohemian bedding collection with everything you need for that perfect chic Boho look. Bright and fun colors in aqua, tangerine and blue tones make this large-scale paisley and geometric pattern set the perfect choice for your bedroom decor. 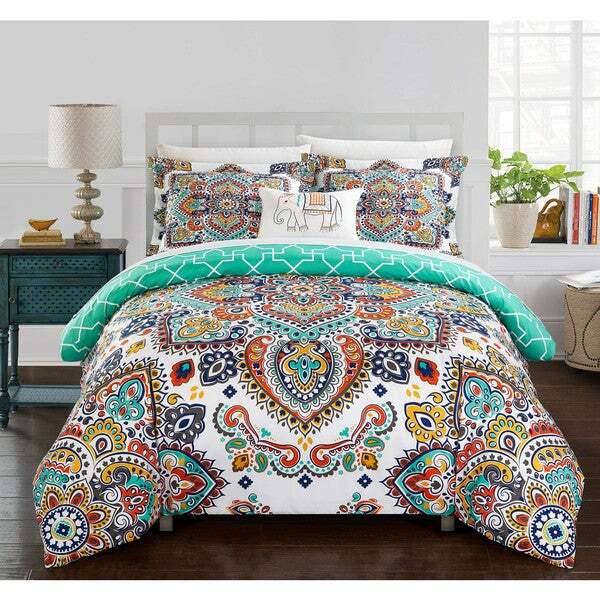 Included are super-soft microfiber sheets, reversible shams and a trendy Elephant deco pillow to complete the look. The comforter was beautiful and nice and awesome price. My only complaint was the sheets. I didn't realize they were 100% polyester so could not use. Had to go buy a new set of sheets and pillow cases not knowing I could not use the ones that came with set. They cost more than the comforter. Still highly recommend the comforter!! I was very happy with the colors on the comforter. I was disappointed after the first wash that long threads were coming out of the comforter. After not more than a week of having this set, I noticed that the pillow with the elephant on it was splitting at the edge, unfortunate for a pillow that sits and looks pretty on a bed. The time I would have to take to pack all of this up without the original wrapping, pay for shipping and wait for an inspection, it’s not worth it. I would not recommend. I love my new bedspread! It is sssooooo soft! Everything is so well made and the colours are very vivid and bright! The stitching is tight and not a lose thread to be seen! I am very happy with my order! The comforter is also very thing and goes well over the matress on all sides. The fitted sheet is very well fitting and snug. The flat sheet is quite soft and also covers the mattress quite well. I cannot wait to break it in! I bought this for my daughter's room. Adds a pop of color and really adds dimension. Not the softest feeling and the sheets are thin but I am sure it will get used for awhile and after a few washes the material will soften. This is even more beautiful in person. It’s heavy enough to keep you warm but light enough so you don’t roast. I’ve kept it on our bed all seasons! Perfect colors to match tons of sheet option. Love it! Everything is extremely comfortable. The only complaint it that there are some loose strings in the embroidery on the decorative pillow. This was a beautiful set... but just to thin for me, I'm cold natured, and I'm use to alternative down warmness, I didn't even take it out of the package, sent it back, gonna order my usual white down comforter. Colorful, light and airy yet warm....,easy to care for, easy to wash, very comfy, yet attractive. I would recommend this comforter set. Money well spent! "Is there red in the pattern?" "I too am interested in knowing when this will be back in stock, if ever. I've been holding off buying a comforter, wanting this in a King size. But if it's discontinued, I'll shop for something else. Thanks." This item will be available in approximately 3 months. Please check back with us. "When will this be in stock?" "How tall of mattress will the king sheets fit?" 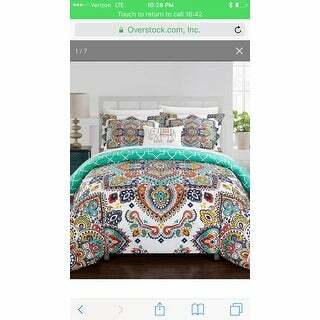 The King comforter is 106 x 92.